Lucinda's Country Inn is a contemporary, arts and craftsman-style home tucked into the Sierra Foothills in Fair Play. From the minute you walk into any of the 600+ sq.ft. suites, you feel pampered. With micro-fiber sheets, crisp linen napkins at breakfast; Lucinda's makes your stay enjoyable and luxurious. A pillow-topped king-size bed with reading lights on the wall, sitting area, eating area and snack bar with coffee maker, sink, microwave and refrigerator -- all are provided to make your stay comfortable. Four themed suites and a separate cottage provide you with seductively, secluded splendor. Each suite is designed with your comfort and privacy in mind -- fireplaces, private deck or porch, individually controlled heat and air conditioning, robes, snack bar, and more. Evening wine and hors d'oeuvres are hosted in the Great Room, where guests can talk about the day's activities, work on the community puzzle, or browse through the books and DVDs in the “Kinkade” library. The spacious rear deck offers a place to enjoy morning coffee or afternoon wine while you are tucked into the trees; it's also a great place to stargaze. In cool weather, the outdoor fireplace will take away the chill. Enjoy our sumptuous hot buffet breakfast in the dining room. 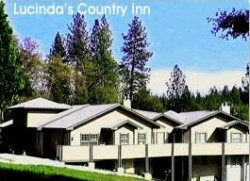 Plan your family retreat, executives' getaways, group outings, wedding or business retreats at Lucinda's Country Inn. We provide Internet connection, WIFI, telephone, conference tables and more to meet your needs with meeting space for up to 30. Live Oaks, Ponderosa Pines, majestic Cedars and of course our 125+ year-old Heritage Oak surround the inn with sights and sounds not found elsewhere. Birds singing, hummingbirds feeding and squirrels, turkey, deer, fox and more roam freely. Lucinda's Country Inn is truly in the heart of the Fair Play Wine Appellation. Wineries on Perry Creek Road are just 1-1/2 miles from Lucinda's. There are over 20 wineries to choose from for an excellent wine tasting experience. Other activities, such as an alpaca ranch, flower garden and Christmas tree farms are minutes away. Vineyard Suite- Watch the stars through the skylight over the king-size bed in the raised bed area, bathed with lavender and purple colored walls. A romantic see-through fireplace separates the sitting area from the bed area. Relax in the full body shower with its four body sprays, the rain head or the hand-held. Before you go outside to the covered deck, tucked into the heritage oak tree, get your glass of wine or morning coffee from the snack bar with its coffee maker, microwave, sink and refrigerator. Laguna Suite - Bright colors reminiscent of the seaside town of Laguna Beach highlight the suite. Aquamarine, like the ocean, washes over the bed area and sitting room walls. A futon and wing chair provide lounging comfort. The walk-in shower with a rock wall and waterfall has a "sandy beach" floor. A wall-mounted vessel sink with a wall faucet gives a touch of elegance. On starry nights gaze at the Milky Way from the private deck. This is the accessible suite for the Inn. Beate Suite - When you walk into the Beate Suite you are swept into the feel of Old World charm and elegance. Escape into the Romanesque tub to soak your troubles away. Golden-hued tile surround you in the large shower. Black granite with the white sink completes the richness of the European elegance of the bath. Arches, hand-blown glass balls, prints and original paintings give the Suite its European presence. Country Suite - Soothing colors warm the suite when the morning sun flows through oak leaves into both the sitting area and the raised bed area. The oval country throw rug provides a homey feel while you enjoy the see through fireplace from the love seat in the sitting area. A large whirlpool tub gives two a romantic, relaxing experience. (Ask about an in suite massage.) The large shower with the built in bench completes your quiet country romantic getaway. Rates: See our website for our specials for the suites and cottage whose standard rates range from $150 to $225. From Stockton: Highway 99 North or South take the Highway 88 (Waterloo/Jackson) east exit. Follow 88 through Lockford & Clements to the 88/12 cutoff. Left turn about two miles east of Clements onto 88. Follow 88 to highway 124 (About 5 miles west of Jackson). Turn on 124 and take it into Ione. At the stop sign on Main Street (A railroad engine is across the street) turn left. At the next corner turn right. About 200 yards turn right onto highway 104 to leave Ione. About 10 miles on highway 104 verve right onto highway 16 toward Plymouth. In Plymouth turn right onto Fiddletown Rd. also AKA: East 16. Stay left at the "Y"; there is a sign that states Fairplay 16 miles. The road changes names to Shenandoah Valley Rd and again to Mt. Aukum Rd. At about the 15-mile mark turn right onto Fairplay Rd. then about 200 yards turn left onto Perry Creek Rd. It is across the road from Pioneer Park. At the .8 mile point is the driveway to Lucinda's Country Inn, turn right. From the Bay Area & Sacramento: Take highway 50 toward Placerville. At the Missouri Flat Rd exit turn right onto Missouri Flat Rd. Go to the dead end and turn left onto Pleasant Valley Rd. About 8 miles is a "Y" with a stop sign, turn right onto Bucks Bar Rd. Go to the 2nd. Stop sign and veer right onto Mt. Aukum Rd. At the gas station/market turn left onto Fairplay Rd. About 200 yards turn left onto Perry Creek Rd. It is across the road from Pioneer Park. At the .8 mile point is the driveway to Lucinda's Country Inn, turn right. From Lake Tahoe, Reno or Carson City: One of two ways: #1: Take highway 50 west to Pollock Pines / Sly Park Exit, turn left to go under highway 50 south on Sly Park Rd. About 16 miles turn left onto Mt Aukum Rd. (The Holiday Market is on the corner Ð on the opposite corner is a shopping center with a Pizza Parlor and Ace Hardware.) Take Mt. Aukum, through the 4 way stop, about 8 miles to the gas station / market and turn left onto Fairplay Rd. About 200 yards turn left onto Perry Creek Rd. It is across the road from pioneer Park. At the .8 mile point is the driveway to Lucinda's Country Inn, turn right. # 2: Take Highway 89 from Lake Tahoe to Highway 88. Turn west onto 88 toward Jackson / Stockton. About one hour on 88 turn onto Omo Ranch Rd., a northerly direction. Follow Omo Ranch Rd about 15 miles to Fairplay Rd. Turn right and go through the stop sign to Perry Creek Rd. (This is the second Perry Creek Rd. The first is at the stop sign. Do not turn at the stop sign.) Pioneer Park is on the left, turn right onto Perry Creek Rd. At the .8 mile point is the driveway to Lucinda's Country Inn, turn right.